Keep your kilt up... or on... or... you know what we mean! Kilt belts are adjustable using Velcro which give them a nice clean look! 2X 50-58" wasit Kilt belts are adjustable using Velcro which give them a nice clean look! This is a much nicer quality leather than our $25 belt. Buckle - Got Kilt? 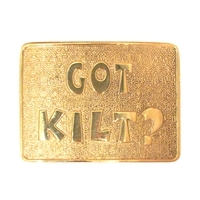 Brass Buckle - Got Kilt? 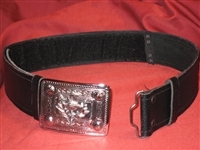 This is the buckle ONLY so be sure to pick up a belt to go with it. These are standard kilt belt buckles with leather glued to the face, hand tooled and painted here in Michigan! * 6 Week Delivery on all leather buckles. 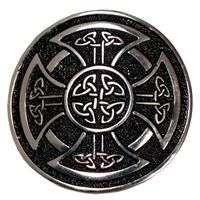 This is the buckle ONLY so be sure to pick up a belt to go with it!